Zeolite amended soils show both increased water retention and nutrient utilization. On top of this, Zeolite fertilizer soil amendments can outperform other amendments by increasing the CEC levels in your soil. Zeolite has numerous advantages in the area of water retention, conservation and nutrient leaching prevention. Zeolite is capable of holding up to 60% of its weight in water. Tests have shown Zeolite can increase water infiltration by 7%-30% on gentle sloped land and up to 50% on steep sloped land. Consequently, overland surface runoff is reduced, in turn protecting lands from erosion. Use of soluble N fertilizers is a major cause for groundwater contamination. Zeolite reduces nitrate leaching by inhibiting the nitrification of ammonium to nitrate. Zeolites ability to retain moisture is another positive aspect for using Zeolite as a soil amendment. Zeolites are great for aeration as they can hold up to 60% of their weight in water due to the high porosity of their crystalline structure. Zeolite acts as a non-form changing, permanent water reservoir which provides prolonged moisture during dry periods as well as promoting rapid re-wetting and improved lateral spread in the root zone during irrigation. This in turn reduces the quantities of water needed for irrigation. The porous structure of natural zeolite also helps to keep the soil well aerated. Unlike other soil amendments such as lime and clay, Zeolite does not break down over time, but remains in the soil to improve nutrient and water retention which can significantly reduce costs of water and fertilizers over time (Demir H, 1993). Zeolites porous structure will not clog soil pores over time like clay will. 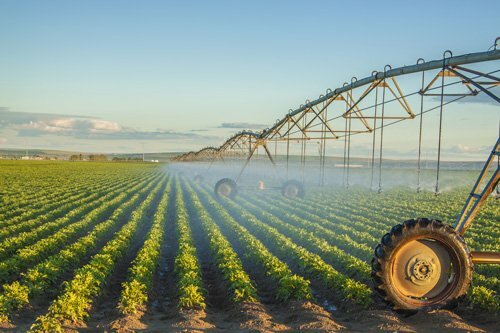 Crops watered with knowingly or unknowingly arsenic contaminated groundwater can lead to uptake into edible crops, eventually finding its way up the food chain. Zeolite’s affinity to arsenic allows it to capture and hold heavy metals and select toxins such as arsenic, the plant will not exchange for them if given the choice. When in free form, the plant has no other option but to take up heavy metals. Turf-grass root zone materials are generally chosen for good drainage, resistance to compaction, and good aeration. This mixture is prone to low cation exchange capacity along with low water holding capacity (Petrovic, 1993). Both cation exchange and soil water retention are thing Zeolite fertilizer can help with. Alongside organic matter such as peat or composts, Clinoptilolite Zeolite will improve the CEC of soils, increase efficiency of water uptake, and increase nutrient utilization. All while reducing nitrate leaching (Petrovic) and staying in your soils year after year due to the characteristics of Zeolite soil amendments. The general physical makeup of peaks and valleys on any green or fairway can cause water to runoff slopes and pool in valleys. Specialized watering schedules can help, but will only minimize the problem, wasting valuable resources. The use of water soluble-fertilizers to add-in Nitrogen, Potassium, and Phosphorus to turf can have a low efficiency rating and runoff when spread onto unamended sand-based soils. Zeolite enhances the performance of fertilizers by making them resistant to leaching, immobilization, and gaseous losses. They are particularly useful in reducing leaching in sandy soils by increasing the CEC values and decreasing volatilization. Zeolite itself carries small amounts of plant nutrients. Their use as inorganic amendments stems primarily from their high nutrient-exchange capacities, which allow them to absorb and release plant available nutrients and moisture without changing or breaking down the structure of the Zeolite. This absorption/adsorption allows Zeolite to hold nutrients in its structure which acts as a slow release fertilizer to exchange nutrients with turf as needed, increasing fertilizer efficiency. This is especially important during turf establishment or heavy rainfall which can increase leaching to 10x normal (Shaddox, 2003) especially in low CEC sand based soils. Once entered into soil either through a mixture of organic material such as compost or top-dressed after aeration, Zeolite will work its way down into the root zone and proceed to provide benefit year after year, while still draining after compaction because of its porous structure. A BMP study done by Cornell University in 2014 speaks on water infiltration rates that are dependent on soil makeup and texture. Sandy soils tend to have a high porosity and greater infiltration rates which affect root zone depth and watering frequencies. Because of this, amendments are often needed to increase nutrient and water holding capacity (NYUgolf.edu). Preferential flow and compaction restrictions can lead to dry spots or saturated areas that Zeolite can help amend and work the water flow toward the more desirable matrix pattern. Most turfs are constructed using a sand substrate that promotes rapid water infiltration and high air porosity. Zeolite acts similarly in terms of air porosity while increases infiltration. In 2007, the USGA released a summary of root zone amendments showing the downsides and lack of root zone maturity to non-amended sandy soils. Zeolite’s distinguished properties on CEC, free structural water storage, and surface adsorption have great potential applications on soil ameliorating. During the 1960s, Japanese farmers used Zeolite to control the moisture content and odor of animal waste while increasing the pH level of their acidic volcanic soils when spreading manure. They later learned that Clinoptilolite can be fed in small amounts to pigs, chickens, and ruminant animals to give a noticable increase in body weight while improving the overall health of the animal. Farmers soon learned Zeolite was remaining in the root zones of their crops and providing continuous efficiencies to their yields. Since then, Zeolite has primarily been used as a feed additive and soil amendment throughout Asia and Europe. In the US, Zeolite soil fertilizer amendments have been utilized since the mid-1980s both as feed additives and as amendments to sand-based soils. Their ability to capture and hold NH4+ and K+ ions enhances plant establishment while reducing nutrient leaching (Goatley, 2011). Nitrogen loss by volatization of ammonia to the atmosphere is the main factor responsible for low efficiency of urea when applied on soil surface. In extreme conditions, close to 80% of N applied can be lost (Lara-Cabezas, Motta, 1997). The urea N losses can be reduced using Zeolite as additives in the fertilizers or in the soils to control the retention and release of NH4+ ammonium (Rehakova, 2004). Zeolite can stabilize NPK levels even though it itself carries only small amounts of plant nutrients. Their use in crop production stems primarily from their high nutrient-exchange capacities, which allow them to absorb and release plant available nutrients and moisture without any change in the nature of the Zeolite. This action is a result of the minerals porous but stable chemical structure that was previously discussed. Zeolite enhances the performance of fertilizers effect on NPK by making them resistant to leaching, immobilization, and gaseous losses. They are particularly useful in reducing leaching in sandy soils. In one study, 4-8 tons of Zeolite per acre was applied. Yield increases were reported for wheat at 14%, eggplant at 19%-55%, carrots at 63%, and apples at 13%-38% (Suthuraman, 2008). The U.S. Geological Survey (USGS) has experimented with Zeolite to help control the release of fertilizer nutrients in soil. The use of soluble fertilizers can lead to water pollution and inefficient use of nutrients. Nitrogen, for example, can leach into ground and surface waters, especially in sandy soils. Phosphate can also become fixed and unavailable to plants in tropical and calcareous soils. Zeolites are porous minerals with high cation-exchange capacity that help control the release of plant nutrients in agricultural systems. Zeolites can free soluble plant nutrients already in soil, and may improve soil fertility and water retention (Eberl, 2014). Ida-Ore Zeolite holds then slowly releases valuable plant nutrients as plants need them. Better plant growth and utilization of fertilizers can be achieved with Zeolite’s affinity to Nh4+, K+, Mg2+, as well as valuable micro nutrients. Nitrogen fertilizers such as urea and ammonium nitrate are noted for high N loss through ammonia volatilization (Prasertsak, 2001) and hydrolysis (Mengel, 1987). Ammonium volatilization is the direct loss of Nitrogen that is available for plant uptake (Sutton, 1994), meaning it is gone, into thin air. This wastes both time and money for the farmer. Zeolites can be used to minimize ammonia loss because they absorb important nutrients such as ammonium (NH₄+) and potassium (K+). Hydrolysis is the occurrence of urea’s enzymes breaking down the urea molecule into NH₄+. The small channels within the Zeolite have been reported to reduce nitrification by microbes and physically protect the NH₄+ from quickly breaking down (Ming, 1986). Once the nutrients are sorbed, they become available for timely release and optimal plant uptake. This means they have now turned a volatile fertilizer into a time release fertilizer (Ahmed, 2010), increasing its value and allowing the crop more time to utilize the nutrients. Clinoptilolite Zeolite can be used to amend NPK fertilizer to reduce ammonia loss. This is possible in part to Zeolite’s high CEC and high affinity for the NH₄+ compound (Stumpe, 1984; Ming and Dixon, 1986). Studies have shown that ammonia losses over 12 days of incubation in a trial with an ammonium nitrate control and six different levels of Zeolite amended into the soil, were significantly lower than soil supplied with ammonium nitrate alone (Lija, 2012). The conclusion of the same study stated that Zeolite effectively reduced ammonium volatilization compared to a control blend of only commercial fertilizer and ammonium nitrate. Zeolite holds ammonium and other nutrients in the crystal structure where they are not water soluble but are plant accessible on an as-needed and time-release basis. As discussed, Zeolite has a high affinity for the ammonium ion, which is a plant usable form of nitrogen. Compost is a good avenue to get Zeolite into the soil without the need to specifically spread. Zeolite can be spread over the top of compost piles and turned in at a rate of 5%, 10%, 15% or 20% of total volume. Zeolite added at the start of the composting process has the ability to increase the amount of nutrients at the end result by decreasing the amount of ammonium lost in the process. It does so by inhibiting the nitrification of ammonium to nitrate. The repeated turning that is necessary to create a good quality compost will mix in the zeolite, adding value that will stay in the soil long after the organic matter in the compost has run its course. Large scale tests were run at Magic Valley Compost in the Jerome, Idaho area. Various cattle by-product based composts were used, the Zeolite helped retain moisture levels initially, but overall did not significantly affect or alter the composting process, while capturing ammonium that would have normally been volatilized. Zeolite works as a Soil Amendment for fertilizer through a combination of absorption capabilities with the large porous area within each Zeolite granule, and adsorption capabilities though its cation exchange capacity (CEC) and overall negatively charged structure. This combination of capabilities allows Zeolite to perform many functions when amending soil for farmland or increasing the value of a pre-blended fertilizer. Water Utilization is increased, especially on sloping lands, the internal matrix absorbs water and holds it for extended periods in the root zone, improving that soil’s water retention and aeration capabilities. With costs of Nitrogen ranging from $.60 per pound of N from chemical sources and up to $30.00 per pound from organic sources, farmers that use Zeolite to amend soils can reduce both ammonium volatilization and hydrolysis that takes place in their soils. Zeolite is there by able to help stabilize NPK levels in your soil. Ida-Ore Zeolite recommends a soil amendment mesh size of 14-40 which equates to particle sizes of 1.18mm down to .416 mm, or roughly the size of a large beach sand. This size allows for easy spreading and a small enough granule to quickly absorb/adsorb ions. Overall, the ultimate goal is to increase crop yields while using best management practices to provide a sustainable growing platform year after year. Once Zeolite is in your soil, it will stay there year after year, providing benefits that will reduce costs and improve farmland soils for generations.